The Energy Information Administration (EIA) released its weekly data on diesel and gasoline retail prices for the week ended January 29th, 2017. At the national level, gasoline prices increased by 4.0 cents per gallon, while diesel prices rose by 4.5 cents per gallon. Both diesel and gasoline prices rose in all PADDs across the country. During the week ended January 26, WTI crude prices surged by $2.53/b. WTI crude prices were in the range of $56-$57/b in mid-December. By the end of December, they hit the $60/b mark. Last week, WTI prices hit $66/b, prices not seen in three years. Currently, WTI crude prices have eased and are hovering around the $65/b level. Strong crude prices are buoying refined product prices in spite of subdued product demand. During the first three weeks of January, apparent demand for gasoline was 8726 kbpd, relative to December 2017’s apparent demand of 9109 kbpd. Diesel product supplied during the first three weeks of January was 4080 kbpd, relative to 3991 kbpd in December 2017. 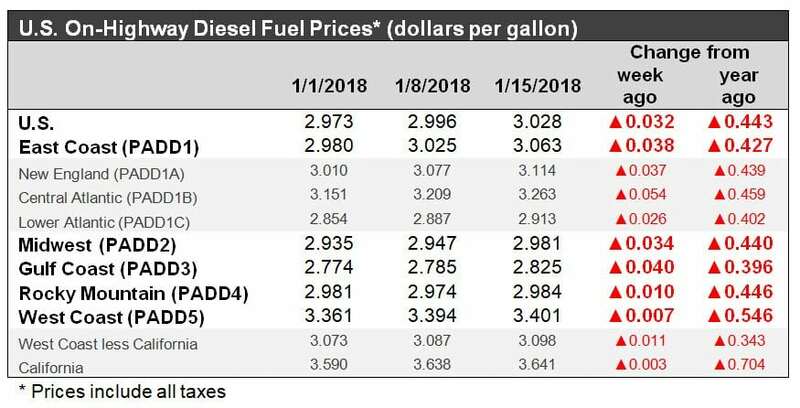 For the current week ended January 29, diesel prices rose by 4.5 cents to arrive at an average price of $3.070 gallon. This marks the third week in a row that US national average retail diesel prices have exceeded $3/gallon. These prices are the highest seen since the week ended January 12th in 2015. In the East Coast PADD 1, diesel prices rose 3.4 cents during the week to average $3.112/gallon. Three weeks ago, PADD 1 joined PADD 5 in having diesel prices exceeding $3/gallon. Within the PADD, New England prices rose by 2.4 cents to average $3.160/gallon. Central Atlantic diesel prices increased by 3.0 cents to reach $3.306/gallon. This submarket has had diesel prices above $3/gallon for the past twelve weeks. Lower Atlantic prices increased by 3.9 cents to arrive at an average price of $2.968/gallon. 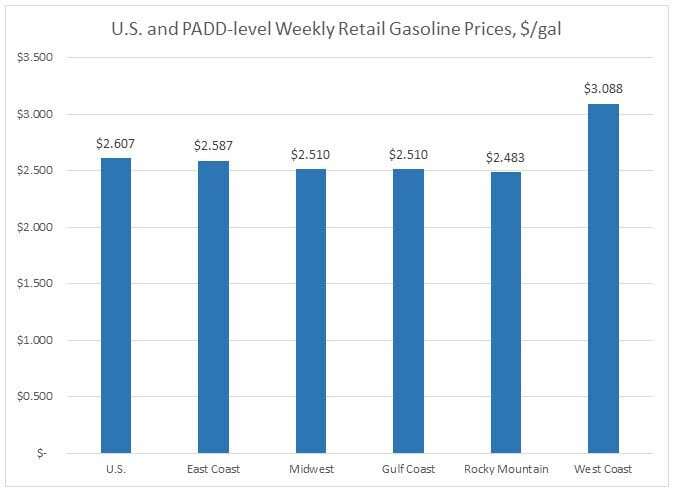 PADD 1 prices were 49.0 cents/gallon above their prices for the same week last year. In the Midwest PADD 2 market, retail diesel prices rose significantly by 5.9 cents to average $3.03/gallon. PADD 2 is now the third PADD, following PADD 5 and PADD 1, to have retail diesel prices exceed $3 per gallon. Prices were 53.0 cents/gallon above their level for the same week last year. 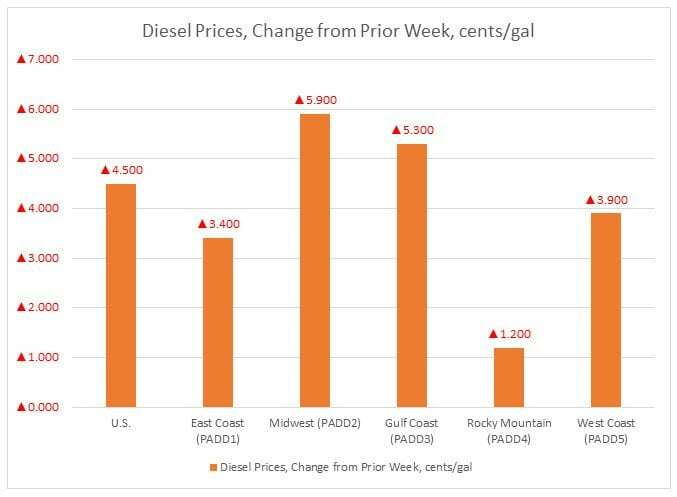 In the Gulf Coast PADD 3, retail diesel prices increased by 5.3 cents to average $2.868/gallon. This price was 46.0 cents higher than for the same week in the previous year. In the Rocky Mountains PADD 4 market, retail diesel prices rose by 1.2 cents to average $2.967/gallon. PADD 4 prices were 45.1 cents higher than in the prior year. In the West Coast PADD 5 market, retail prices increased by 3.9 cents to average $3.434/gallon. This price was 58.9 cents above its level from last year. Prices excluding California rose by 3.7 cents to average $3.120gallon, which was 37.6 cents above the retail price for the same week last year. California diesel prices rose by 4.0 cents to an average price of $3.683/gallon. This price was 75.6 cents higher than last year’s price. Until three weeks ago, PADD 5 had been the only PADD to have diesel prices above $3 per gallon. The upward trend around the country has brought retail averages above the $3/gallon mark on the national level. 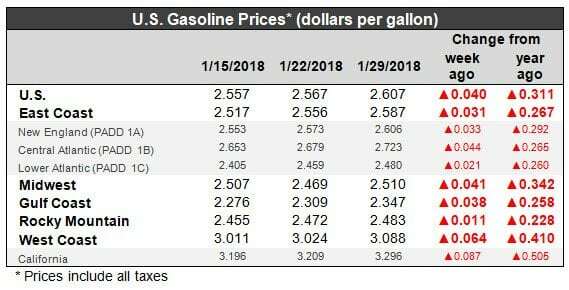 U.S. retail gasoline prices increased by 4.0 cents during the week ended January 29, to arrive at an average price of $2.607/gallon. For the current week ended January 29, East Coast PADD 1 retail prices for gasoline rose by 3.1 cents to $2.587/gallon. The average price was 26.7 cents higher than last year’s price. Prices increased by 3.3 cents in New England to $2.606/gallon. Central Atlantic market prices rose by 4.4 cents to $2.723/gallon. Prices in the Lower Atlantic market moved up by 2.1 cents, to an average price of $2.480/gallon. This was 26.0 cents higher than last year’s average price for the same week. In the Midwest PADD 2 market, retail gasoline prices increased by 4.1 cents to arrive at an average price of $2.51/gallon. Gasoline pump prices were 34.2 cents higher than they were one year ago. In the Gulf Coast PADD 3 market, gasoline prices rose by 3.8 cents to average $2.347/gallon. PADD 3 continues to have the lowest average prices among the PADDs. Prices for the week were 25.8 cents higher than for the same week in 2017. 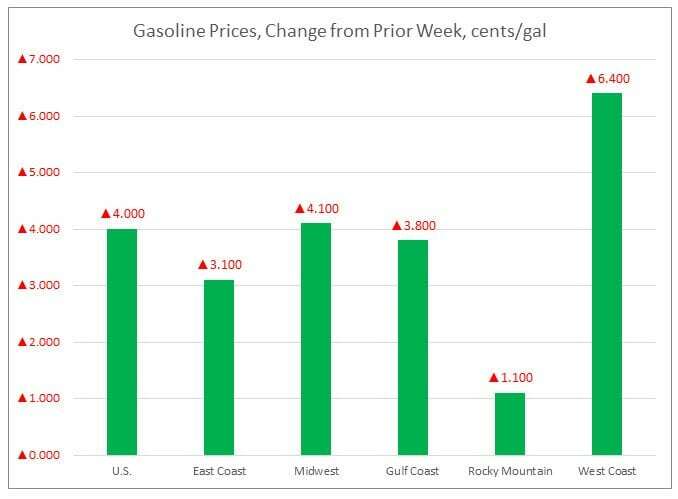 In the Rocky Mountains PADD 4 market, gasoline pump prices increased by 1.1 cents to average $2.483/gallon. PADD 4 prices were 22.8 cents higher than at the same time in 2017. In the West Coast PADD 5 market, retail gasoline prices jumped 6.4 cents to arrive at an average price of $3.088/gallon. This was 41.0 cents higher than at the same time a year ago. PADD 5 typically has the highest gasoline prices among the five PADDs, and its retail gasoline prices exceeded $3/gallon for most of mid-November and early December. 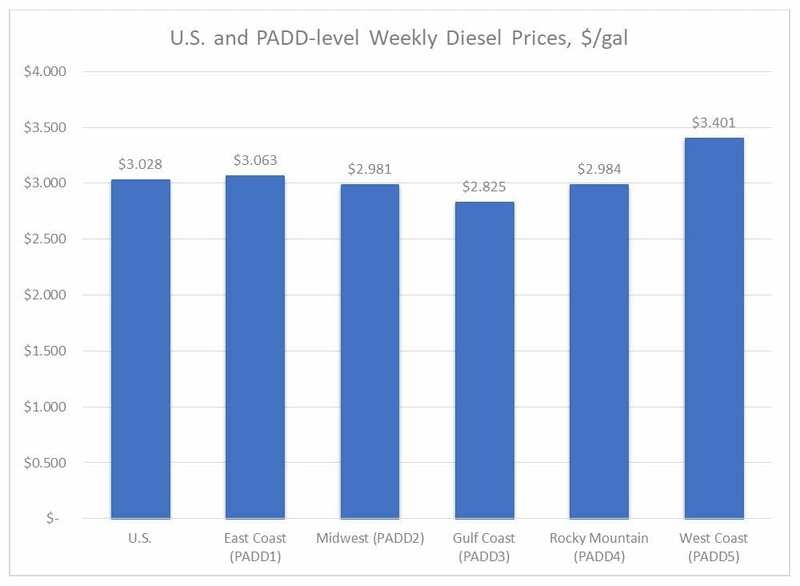 During the four weeks of 2018 to date, PADD 5 prices have exceeded $3/gallon. Excluding California, West Coast prices rose by 2.5 cents to an average of $2.729/gallon. This was 24.6 cents higher than at the same time in 2017. In California, prices rose significantly, increasing by 8.7 cents to arrive at an average pump price of $3.296/gallon. California prices were 50.5 cents per gallon above their levels from last year.